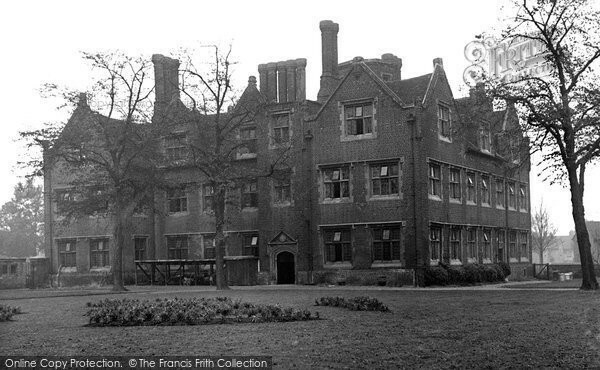 Ghostly Memories Of Eastbury House - a Memory of Barking. I am Barking born and bred on 25.04.1921 and lived in Fanshaw Avenue which was not far from Eastbury House. I have now reached the age of 92 and would like to share a memory which until very recently I kept to myself. I remember the old creepy Eastbury House which was then untenanted and sustained damage from Hooligans, the high brick wall which skirted the grounds and the shaded areas which were eerie if you were on your own but o.k. if you were with friends or with a boyfriend! I can still see in my minds eye, my lovely dad who would come out looking for me if I wasn't home by 9pm and often found me in the shaded spots of the high brick wall of Eastbury House, with a boyfriend! One night I saw these six hooded monks wearing capes and talking amongst themselves in a highly agitated a disturbed manner, in the grounds. They walked towards me then vanished into thin air. They were just ghosts, and my first and only experience, thank God! Just recently my step-daughter has done some research on Eastbury House and there is another story to tell! There was indeed a connection with the Church! It dates back to feudal times.The Abbess of Barking held it after the establishment of the feudal system as part of her manor. Barking abbey was dissolved in 1539 under Henry V111 and was passed onto favoured subjects of the King. It was leased to the Barking Urban District Council in 1934 and was a museum for a while. During the 2nd World War the house became an ARP (air-raid platform) and a nursery for young children. Today the Council manage it on behalf of the National Trust and it is a Head Office for Barking Arts Council. A memory shared by Winifred Lines on Sep 8th, 2013. Send Winifred Lines a message. To Ken h . It's seems you also asked me if I knew your family. A while ago the reason for not replying was I haven't been back on this site till now ,but I'm afraid I cannot recall the name. You don't see the to have said what year,school or age these people would have been . I was born in 1935 lived in Kings road of north st. And my first school was st Margarets C /E started there at about the age of 4 my nan lived in Pelham avenue just round the corner from Eastbury House Last year along with my sister and one of my daughter we visited Eastbury House and although I had been there in the past we had a very nice man give us I guided tour. You can imagine when we went upstairs to one of the rooms that had a lot of photos etc. We saw some photos of a group of air raid wardend and my grandad was amongst them,a photo of my sister at the nursery school. And my nan who had been a cook during the nursery era there was a couple of photos with her included. So it ended up being a very worthwhile visit. It was always put about that there was a tunnel from St Margarets Church to Eastbury House but the gentalman who took us on the tour send there had been extensive investigations but nothing found also that guy falls had hid there but can't rember the outcome of that.